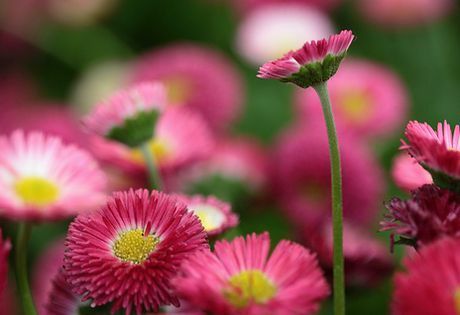 Bellis are perennials that reach an height of about 20cm and flower from the late spring through to the beginning of summer. The common names for Bellis include Daisy, Bachelor's button, Meadow daisy and English daisy. They have solitary flowers of white, pink or red. They make good plants for rockeries. Bellis Perennis by Saturn ♄. Common Daisy by Dawn Endico. Common Names: Daisy, Bachelor's Button. Daisy: English; Common; Annual; Meadow; Corsican; Southern; Spanish. Life Cycle: Hardy perennial usually grown as a hardy annual or hardy biennial by gardeners. Height: 3 to 8 inches (5 to 20 cm). Flowers: Late spring and summer. Flower Details: Composite flower. Flowers are on single stalks. White, red or pink; usually with a yellow eye. Sow Outdoors: Surface. Early spring before the last frost or in autumn. Sow in mid-summer or autumn in warmer areas. Spacing 5 to 8 inches (12 to 20 cm). Sow Indoors: Germination time: ten days to four weeks in the light. Temperature 70°F (21°C). Transplant outdoors following the last frost in cool areas; or in late summer or early autumn in warmer areas. Requirements: Full sunlight or partial shade. Moist soil. Rich soil. Regular watering. Requires a feed early in the growing season. Supply mulch in cooler areas to help over-wintering seedlings. Can be divided once flowering has finished. When growing Bellis outdoors it is best to sow out the seeds on the surface from spring to mid summer. They prefer to grow in rich soil and prefer lightly shaded or sunny areas of the garden. 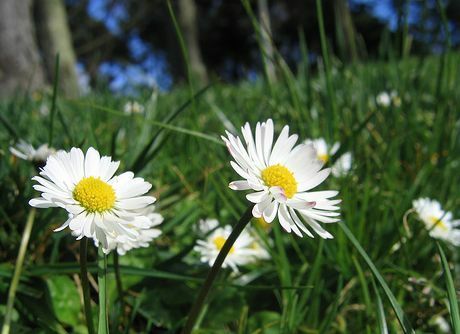 It is important to cut Daisy flowers back after flowering or they may take over the garden.